I was in the 6th grade in 1978. That summer my sister worked at the Flowmotion water slide and skate park in South Austin, and I spent every day skateboarding and going down the water slide to cool off. That was the summer the first Cars album hit the air waves. The sound was fresh, accessible and infectious and we were captivated. Good Times Roll, Bye Bye Love, and Moving in Stereo were major highlights on the summer soundtrack. As we moved from the 70s to the 80s The Cars sound become more Pop and I was less interested with each release. 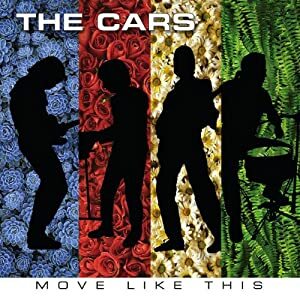 When I heard that The Cars were going to release a new album after 24 years my first reaction was to ask why? Then I began to wonder how they would sound without the late Benjamin Orr. The answer is, they sound just like they did in the mid 1980s. Move Like This sounds EXACTLY like they did in the mid 1980s. It’s almost as if these recordings have been sitting on the shelf for 24 years. The same hook laced Synth led Pop dance tunes and cheesy ballads. On one hand I have to applaud The Cars for not feeling like they needed to update their sound for the kids of today. On the other, it feels like I have heard it all before since they have not updated their sound. So now I am left wondering who this album is aimed at. Clearly people in their forties who loved the sound of the 80s will love this record. It’s got everything they could want and will return them to days of yesteryear. Alternatively for the kids who want to go back to the glorious sound of Casio Synths and overly reverberated drum machines, they will find exactly what they are looking for too. For those who fall somewhere between those two categories this is a great recording from a band that helped define the sound of an era. Unfortunately for me, I was hoping to find a little more of the sound of that original Cars album. That sound that existed so briefly between 70s and 80s rock. Edgy and funky with a little more grit than what became known as the sound of the 80s.